Growing up in India this humble tree grew in our backyard and it never caught my attention, though I always loved the vegetable that grew on it. As I entered into the world of Ayurveda I learnt about this most nutritious tree in the world called Moringa only to realize that this tree was a childhood friend that I had loved and this world famous Moringa was my backyard fried the drumstick tree or Sajana as we used to call it. According to Wikipedia Moringa, a native to parts of Africa and Asia, is the sole genus in the flowering plant family Moringaceae. The name is derived from the Tamil word Murungai (முருங்கை) . It contains 13 species from tropical and subtropical climates that range in size from tiny herbs to massive trees. The most widely cultivated species is Moringa oleifera, a multipurpose tree native to the foothills of the Himalayas in northwestern India and cultivated throughout the tropics. M. stenopetala, an African species, is also widely grown, but to a much lesser extent than M. oleifera. As Moringa spread from India to other tropical and subtropical areas, it adapted to local conditions. Over time, these thirteen distinct species of Moringa developed. The tree is often referred to as “The Miracle Tree” and “Mother’s Best Friend”, which is understandable when you learn that Moringa contains a unique combination of vitamins, minerals and amino acids that make it one of the most nutritious plants ever discovered. Much of the plant is edible by humans or by farm animals. Moringa leaves are exceptionally nutritious. When fresh, they are rich in vitamin C. When carefully dried, gram for gram Moringa leaves contain 24 times the iron of spinach, 16 times the calcium of milk, 9 times the vitamin A of carrots, many times the potassium of bananas, and every essential amino acid your body needs. The leaves are rich in protein, vitamin A, vitamin B, vitamin C and minerals . 100g of fresh Moringa leaves have 8.3 g protein, 434 mg calcium, 404 mg potassium, 738 μg vitamin A, and 164 mg vitamin C .
Moringa contains 46 powerful antioxidants – compounds that protect the body against the destructive effects of free radicals by neutralizing them before they can cause cellular damage and disease . Calcium, Chromium, Copper, Fluorine, Iron, Manganese, Magnesium, Molybdenum, Phosphorus, Potassium, Sodium, Selenium, Sulphur, Zinc  . Isoleucine, Leucine, Lysine, Methionine, Phenylalanine, Threonine, Tryptophan, Valine . Jed W. Fahey, Sc.D. , Johns Hopkins School of Medicine, Department of Pharmacology and Molecular Sciences produced a very important research paper titled: “Moringa oleifera: A Review of the Medical Evidence for Its Nutritional, Therapeutic, and Prophylactic Properties. Part 1.” In this seminal work, they began the process of sifting through the scientific work on Moringa, as well as the traditional, as well as anecdotal evidence for Moringa’s nutritional, therapeutic and prophylactic. In doing this, they found that much of the scientific evidence is beginning to support much of the traditional and anecdotal information. Moringa preparations have been cited in the scientific literature as having antibiotic, antitrypanosomal, hypotensive, antispasmodic, antiulcer, anti-inflammatory, hypo-cholesterolemic, and hypoglycemic activities, as well as having considerable efficacy in water purification by flocculation, sedimentation, antibiosis and even reduction of Schistosome cercariae titer. Antibiotic Activity: This is clearly the area in which the preponderance evidence—both classical scientific and extensive anecdotal evidence—is overwhelming. The scientific evidence has now been available for over 50 years, although much of it is completely unknown to western scientists . Phytochemicals and 6 Carbon Sugar Rhamnose: An examination of the phytochemicals of Moringa species affords the opportunity to examine a range of fairly unique compounds. In particular, this plant family is rich in compounds containing the simple sugar, rhamnose, and it is rich in a fairly unique group of compounds called glucosinolates and isothiocyanates. For example, specific components of Moringa preparations that have been reported to have hypotensive, anticancer, and antibacterial activity . Subsequent elegant and very thorough work, published in 1964 as a PhD thesis by Bennie Badgett (a student of the well-known chemist Martin Ettlinger), identified a number of glycosylated derivatives of benzyl isothiocyanate  (e.g. compounds containing the 6-carbon simple sugar, rhamnose) (8). The identity of these compounds was not available in the refereed scientific literature until “re-discovered” 15 years later by Kjaer and co-workers (73). Seminal reports on the antibiotic activity of the primary rhamnosylated compound then followed, from U Eilert and colleagues in Braunschweig, Germany (33, 34). They re-isolated and confirmed the identity of 4-(α-L-rhamnopy-ranosyloxy)benzyl glucosinolate  and its cognate isothiocyanate  and verified the activity of the latter compound against a wide range of bacteria and fungi. (Jed W. Fahey, 2005) This is clearly the area in which the preponderance of evidence—both classical scientific and extensive anecdotal evidence—is overwhelming. The scientific evidence has now been available for over 50 years, although much of it is completely unknown to western scientists . The main objective of this study was to isolate compounds from root wood of Moringa stenopetala and evaluate antibacterial activities of the isolated compounds. Three of the compounds namely cholest-5-en-3-ol, palmitic acid and oleic acid showed highest activity against E. coli. The observed antibacterial activities of the crude extract and the isolated compounds could justify the traditional use of the plant for the treatment of different bacterial infections . pylori is an omnipresent pathogen of human beings in medically underserved areas of the world, and amongst the poorest of poor populations worldwide. It is a major cause of gastritis, and of gastric and duodenal ulcers, and it is a major risk factor for gastric cancer (having been classified as a carcinogen by the W.H.O. in 1993). Cultures of H. pylori, it turned out, were extraordinarily susceptible to , and to a number of other isothiocyanates (37, 60). These compounds had antibiotic activity against H. pylori at concentrations up to 1000-fold lower than those which had been used in earlier studies against a wide range of bacteria and fungi. The extension of this finding to human H. pylori infection is now being pursued in the clinic, and the prototypical isothiocyanate has already demonstrated some efficacy in pilot studies . Since Moringa species have long been recognized by folk medicine practitioners as having value in tumor therapy, we examined compounds for their cancer preventive potential. Recently, these compounds were shown to be potent inhibitors of phorbol ester (TPA)-induced Epstein-Barr virus early antigen activation in lymphoblastoid (Burkitt’s lymphoma) cells . • A study on Moringa leaf extract to determine its effect on experimental gastric ulceration concluded that the leaf extract can be beneficially used in the management of gastric ulcer in contrast to the classical antacid, antihistamine or surgical treatment . • Two weeks of treatment with Moringa Oleifera healed gastric ulcer damage . • Moringa is found to significantly reduces muscle cramps, decreases body temperature, and enhances sleep . • Moringa has been found to have significant benefits to heart . Water extract of Moringa Oleifera leaves possesses strong antioxidant activities. The prevention of artherosclerotic plaque formation in artery as well as the lipid lowering activity of the extract has been shown in rabbit fed with high cholesterol diet. M. Oleifera has high therapeutic potential for the prevention of cardiovascular diseases. • Moringa seeds have shown anti-fungal ability and effectiveness against athlete’s foot . • Moringa water extract has shown to prevent kidney stone formation and dissolve already performed stones . According to Vaidya Mishra  , an Ayurvedic expert from the Shankha Vamsa lineage, Moringa is both a detoxifier as well as a tonic. Whenever we detox we also use a tonic, Moringa does both. It purifies and nourishes the blood and muscle tissues, the bone marrow and the fat tissues of any toxins at the same time nourishing it. • Strengthens heart/ hridya, fat metabolism and weight loss/Medovishahara and regulates cholesterol. In Bhava Prakash (16 Century canonical textbook of Ayurveda), part one, authored by Bhav Mishra and Rajnigantu, Moringa is called sigru, or “it moves like an arrow” in the body because it rapidly penetrates the tissues and has deep absorption and detoxification ability, making its effect on the deep bone marrow tissue swift and effective. • It cleans and clears the ulcers (vranadosanut). Vrana means ulcer. • By binding the toxins in the blood, and cleaning the blood (due to its hot potency and pungent taste and post digestive taste), it relieves long term burning in the skin and stomach. • Prevents and rids the tumors. When the clean blood circulates, growth of tumors are prevented and also if tumors are present, gets rid of the tumors (gulmanut). • The Ayurvedic verse on Moringa by Bhav prakash of Bhav Mishra cites Moringa as removing acidic toxins from the blood, cleansing the blood. This in turn lowers bad cholesterol and improves cholesterol metabolism. This correlates the power of Moringa in lowering bad cholesterol and improving cholesterol metabolism. • Kidney Stones: Ushna/hot and thikshana/pungent quality of Moringa stimulates the kidneys, dysuria, increases quantity of urine, removes excess acidity in urine and calculi. Dr. JV Hebbar, summarizes several interesting facts about Moringa in his blog . Krimighna – group of herbs that are used to treat worm infestation. Katuka Skandha – group of herbs that have pungent taste. Veerya – Ushna – hot potency. 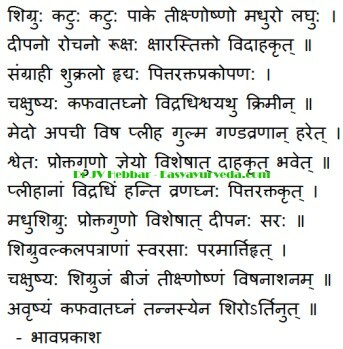 Pittarakta prakopana: Increases Pitta and vitiates blood. Hence, drumstick should not be consumed during bleeding disorders, duriner menstruation and for people with pimples and Pitta related skin diseases. Chakshushya – Improves vision, good for eyes. Vidradhi – Useful in abscess. It helps in quick wound healing of abscess, upon oral intake and external application as paste. Shvayathu – It is a good anti inflammatory herb. Krimi – useful in worm infestation in stomach and in wounds. Meda – helpful to decrease fat and obesity. Apachi – Useful in relieving carbuncles. Visha – Anti toxic. Has detoxifying action. White variety Moringa Properties: It is quite similar to the black variety. In Indian household, the leaves are used to prepare Chutney and Sambar (a south-indian soup). Moringa leaves paste applied externally, or used as vegetable helps to relieve headache. Moringa for Diabetes: Many studies have been conducted to prove the anti-diabetic and anti-oxidant effect of Moringa. As explained above, it causes increase in burning sensation and is pungent. Hence, people with gastritis or sensitive stomach should use this vegetable carefully. Moringa fruit is rich in protein, vitamins, minerals and anti-oxidants. Hence it can be used during pregnancy. But Moringa leaves, root bark and flowers are not indicated during pregnancy. Thus we can see that this humble tree is loaded with wonderful qualities that can be used for healing by an Ayurvedic practitioner. Several scientific studies have documented its great properties of healing like anti-bacterial, anti-cancer, anti-inflammatory, anti-fungal etc. and has been used successfully for hundreds of years. 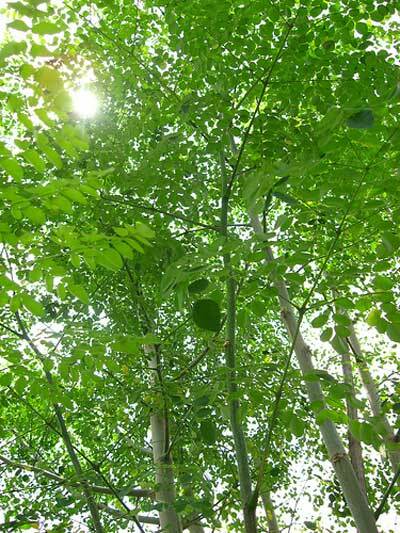 Trees for Life International, Moringa Tree. http://www.treesforlife.org/our-work/our-initiatives/Moringa. Janick, Jules, Robert E. Paull, The Encyclopedia of Fruit & Nuts. (CABI, 2008): 509-510. Debnath, S., & Guha, D., “Role of Moringa oleifera on enterochromaffin cell count and serotonin content of experimental ulcer model,” Indian Journal of Exp Biol, 45(8), (2007): 726-731. Pal, S., Mukherjee, P., Saha, K., M., P., & Saha, B. “Studies on some psychopharmacological actions of Moringa oleifera Lam.”, Phototherapy Research, 10(5), (1996): 402-405. Chumark, Khunawat et. al, “The in vitro and ex vivo antioxidant properties, hypolipidaemic and antiatherosclerotic activities of water extract of Moringa oleifera Lam. leaves,” Journal of Ethno-Pharmocology 116(3) (2008 Mar 28): 439-446. Jain, Pankaj G. et al., “Hypolipidemic activity of Moringa oleifera Lam., Moringaceae, on high fat diet induced hyperlipidemia in albino rats,” Rev. bras. farmacogn., 20(6) (Dec 2010): 969-973. Chuang, P. H., Lee, C.W., Chou, J. Y., Murugan, M., Shieh, B.J., & Chen, H. M. “Anti-fungal activity of crude extracts and essential oil of Moringa oleifera Lam.”, Bioresour Technol, 98(1), (2007): 232-236. Karadi, R. V., Gadge, N. B., Alagawadi, K. R., & Savadi, R. V., “Effect of Moringa oleifera Lam. root-wood on ethylene glycol induced urolithiasis in rats.” J Enthnopharmacol, 105(1-2), (2006): 306-311. Food Chem Toxicol. 48(1), (2010 Jan): 345-355. Bharali R, Tabassum J, Azad MR, “Chemomodulatory effect of Moringa oleifera, Lam, on hepatic carcinogen metabolising enzymes, antioxidant parameters and skin papillomagenesis in mice.” Asian Pacific Journal of Cancer Prevention, 4(2) (2003 Apr-Jun): 131-139. Jaiswal D, Kumar Rai P, Kumar A, Mehta S, Watal G, “Effect of Moringa oleifera Lam. leaves aqueous extract therapy on hyperglycemic rats,” Journal of Ethnopharmacology, 123(3) (2009 Jun 25): 392-396.